"This is when the communitarians start looking for a government rule that will make it harder for people to buy books online"
A business I could never figure out is Borders. I like the concept: a huge book store with a little cafe, encouragement to browse, read, and relax, and plenty of discounted books. I have bought several things from Borders over the years. Yet, one of my earliest blog posts was wondering how on earth anyone could expect the books to stay in buyable shape. When you sell coffee and pastries and encourage people to handle, open, examine, and even read books, its just not possible to avoid damage to the books. I spent 4 hours in a Borders once, just relaxing, drinking some chai, reading, and sketching. Nobody bothered me because that's what they wanted you to do. But I didn't buy anything. Borders is suffering what a lot of businesses are these days: lack of business. The mega book store model is falling down because people can buy books much cheaper online. And unlike some products, when you order a book, you can be reasonably certain you'll get a good product. Nobody is going to sell a box of a book without the book in it, or half a book, or a book that doesn't open or some other weird fraud like other products. I'd never, ever buy a car online, sight unseen. I'll buy a used book for 1 buck. Borders didn't make a bold push into online sales and digital books the way companies like Barnes&Noble did, and as a result they have the biggest nightmare any book seller wakes up screaming about: huge back inventory of unsold books. The problem with selling books is that you have to have enough copies people will find what they want, but only the books people actually want to buy. Like Ms McArdle, I like bookstores, and I try my best to patronize the local one whenever I can. The problem is while we could probably save Borders (or other book stores) by going to shop there regularly, the fact is its inconvenient to drive to the nearby store and browse when you can do it online at home. People aren't shopping at Borders because they forgot the place, but because they just don't need to. I'm a writer, and that means by hurting book publishers and stores I hurt my potential future and earnings. The problem is, the technology and business is changing so much it doesn't matter what I want and hope will happen. 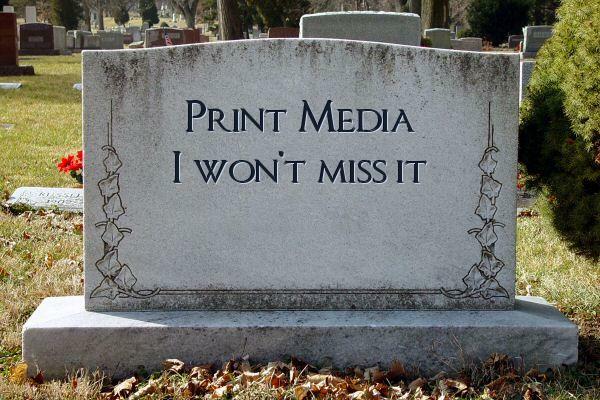 Books will never go away, Egon's pronouncement of print being dead notwithstanding. But the way we've always gotten them is going to change enormously in the next ten years, and so will copyright over the next century. Most people report that reading fiction on an E-Reader is a pretty good experience. Sure, there are flaws in the model which I've written about several times before, but generally speaking people are positive. Non fiction, particularly reference, is miserable on the E-Reader platforms from all reports. You just can't page around rapidly and find reference materials, hold a page open for later and so on. Future models might make this easier, but I suspect some forms of books just won't ever be very useful on E-Readers. And there's no substitute for holding a book in your hand, an actual object with pages to turn. So we'll always have books, we'll just get them differently than we used to. And I think the price for a new book will be more than we're used to right now because the volume will be much lower and they'll probably move more toward print on demand. This isn't all bad, it will give a lot more people like me who aren't established authors or writing the latest trendy kind of book a chance to see publication. Right now its such a gamble to publish than book publishers are taking only what they believe has a very good chance of selling and that means no risks, no taking chances, and fewer new authors. Changing that can only be good for both writers and readers. Unfortunately, the transition means a lot of dreams will die. Borders might go under, like Hollywood Video and the Hupmobile before it. There's no way to avoid that aside from idiotic government subsidies to prop up companies who should have folded. And in the end, we'll be better off as consumers, but in the mean time its going to be pretty hard on some established companies. I must respectfully disagree with you oh mighty poster of the blogs. One of the biggest issues I have with online shopping, is that it is fine if you know exactly what you are looking for, what author you want, what title and so on. Being able to walk into a book store and browse, find new authors, genres even a new set of books from an author you for got you loved cannot be replaced. I do not disagree that there will be closures of these stores, perhaps the complete disappearance of all new book stores soon. But I lament it, and rue the day. I guess I better hurry up and go spend this $20 Borders Gift Certificate I got as a Christmas present! I agree with C_T that bookstores are going to become more and more rare. One issue with retail brick and mortar bookstores is that it increasingly makes more financial sense to list your books online than it does to put them on the shelf for walk-in customers. My wife runs a small used bookstore in our town, and she makes approximately 4 times more money from Amazon sales than walk-in business. She could conceivably keep the store going without the walk-in business, but without amazon and ebay it would be a money-loser. And for store owners, the prospect of not having to conform to retail business hours is powerful. Sitting (or paying someone to sit) behind the counter of the store for 8-10 hours a day waiting for customers to come in vs. making 4 times as much money spending a couple hours listing new titles online and an hour or so filling and shipping online orders... it's sometimes hard to justify the storefront, and if it weren't for a handful of teachers and elderly folks who are just so damn happy their town finally has a book store, my wife would probably shut it down. I agree, browsing is a great deal more interesting and rewarding in a store, and I hope there always will be some around. My guess is that used book stores will be with us for a long time, and they'll always offer browsing options.